You’ve found this article. So I can only assume that you’re half of a couple and you’re looking for a cruise. Knowing where to start when searching for a cruise can be tricky. 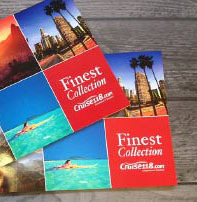 After all, there are over 300 cruise ships to choose from and even more destinations. And you’ll want to find one that you’ll both love. So how on earth do you choose which cruise will give you the perfect holiday you’ve both been dreaming of? It might help to think about what type of couple you are. Otherwise, you might as well be searching for ‘cruises for people’. Do you love making friends and chatting with other couples over dinner? If this is something you’re looking forward to on your cruise, you might want to consider a smaller ship. That way you’ll see the same people again and again and have reasons to chat. Do you prefer to spend time just the two of you? If the thought of sharing your valuable time together with strangers makes you want to lock yourselves in your stateroom and order room service, you might want to consider a larger ship, where you can remain anonymous. A ship with a flexible dining option is also a must, or at least one where you can request a table for two and enjoy dinner undisturbed. If you’re at all worried about getting bored by spending so much time together, select a ship with lots to do on-board, or lots of great ports of call to visit. If you’re used to being always on the go, a long transatlantic crossing with only a couple of stops probably won’t float your boat. Conversely, on many cruise ships, there’s so much to do on-board that it can be hard to fit it all in. Trying to do too much on an action-packed cruise holiday can be exhausting, so if you’re both in need of a relaxing break, pick a cruise with nice weather so that you can relax together without being overwhelmed by a huge ship or too much sightseeing. For many couples, the best cruise is one without children on-board. There are several ships which don’t allow children, so you might want to take a look at these to ensure you get the peace and quiet you’re longing for. However, if you don’t want to share your holiday with thousands of small and loud people, you’re not necessarily restricted to adults-only ships. There are several cruise lines which allow children on-board, but families rarely choose to go on them, especially outside of school holidays. Families have such an excellent choice of ships packed full of water slides, splash pools, kids’ clubs and activities, that they tend not to choose the ships which have little for children to enjoy. The best holiday destination for any couple is one which you’ll both enjoy. Think about the kinds of things you’d both like to do on holiday, and try to incorporate these into your cruise. The wonder of cruising is that you’ll visit so many places during your holiday – so even if you each have different interests, it’s usually possible to accommodate these. Hawaii – This tropical island paradise is the perfect place to relax on the beautiful beaches and admire the lush greenery. Kaui and Maui are possibly the most romantic of islands. Transatlantic – Indulge yourselves in a week of uninterrupted sea days, late night cocktails and breakfast in bed. Heaven. French Polynesia – With islands such as Bora Bora in its archipelago, French Polynesia has some of the world’s best beaches, as well as plenty for active types to enjoy such as snorkelling and hiking. 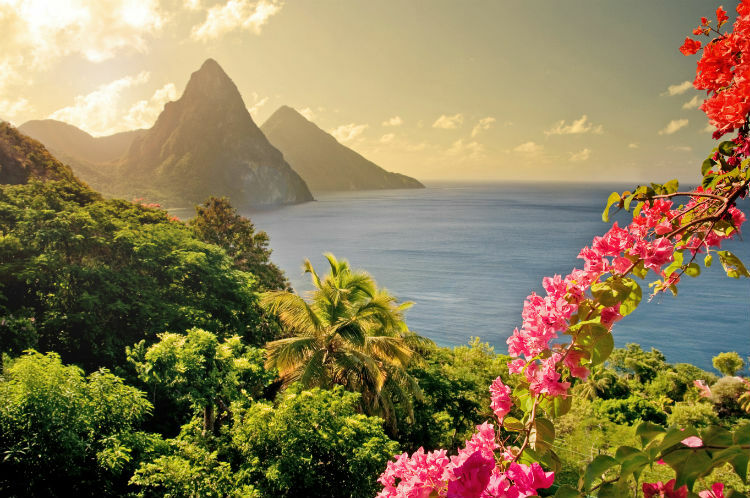 Caribbean – Year-round sunshine and dozens of tropical islands to explore makes the Caribbean a firm favourite with Honeymooners. What could be more romantic than snuggling under tartan wool blankets, sharing a tub of popcorn and staring up at the night sky before watching a film together? You’ll find outdoor movie screens on many ships, and Princess Cruises outdoor cinema is one of the best. Formal nights are a great excuse to dress up to the nines in evening gowns or dinner jackets. Put on your finest outfit, maybe even get your hair done on-board, and your partner won’t be able to look away. Enjoy a sumptuous five-course meal together before watching a show or relaxing with a drink in one of the lounges. You’ll find formal nights on most cruise ships. There’s no more romantic way to enjoy dinner together than in the privacy of your own balcony, looking out to sea. 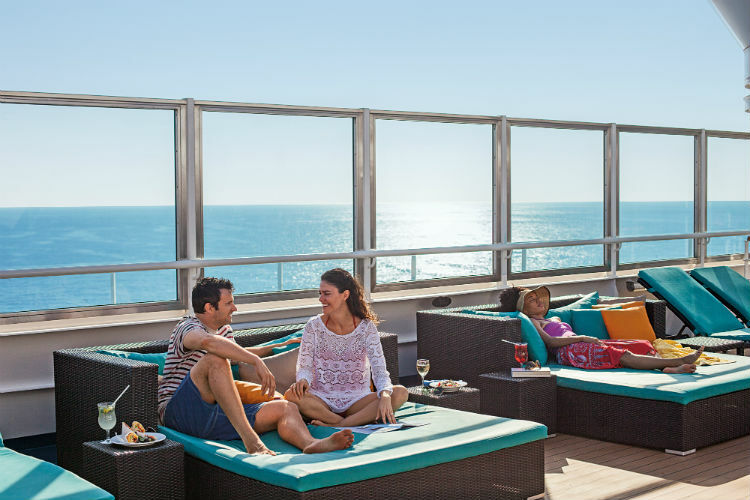 With Princess Cruises ‘Ultimate Balcony Dining’ experience, you can relax as your waiter brings a course-by-course fine dining meal which includes lobster and Champagne. A great idea for a date whilst on-board is to take afternoon tea together. Fred. 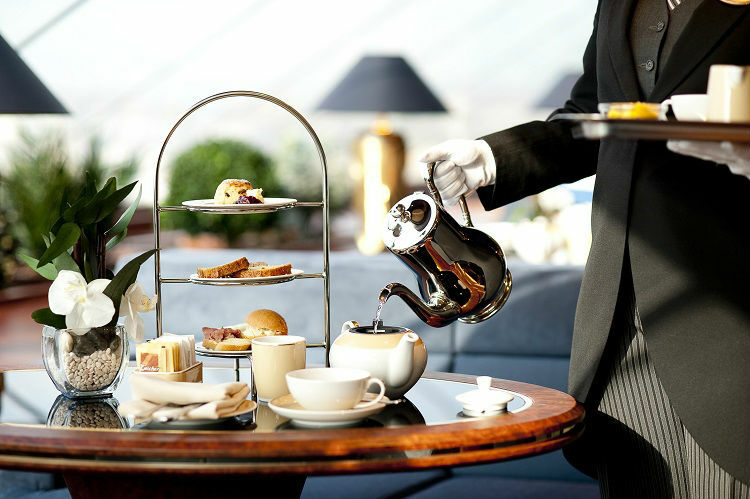 Olsen Cruise Lines have a particularly indulgent offering, with a white-gloved service of tea, scones with jam and clotted cream and finger sandwiches. Imagine spending the day lounging on a double day bed, indulging in a couple’s massage and relaxing in the hot tub together. Many ships have private areas where couples can relax and enjoy comfortable loungers and waiter service. 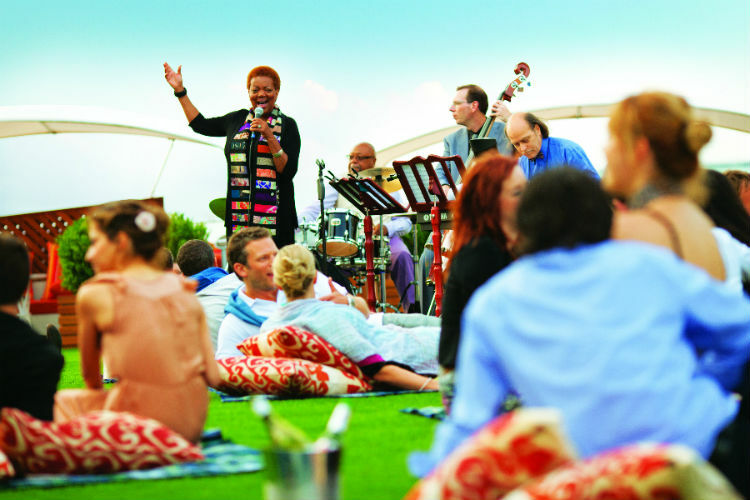 The Sanctuary on-board Princess Cruises’ ships offers just that. 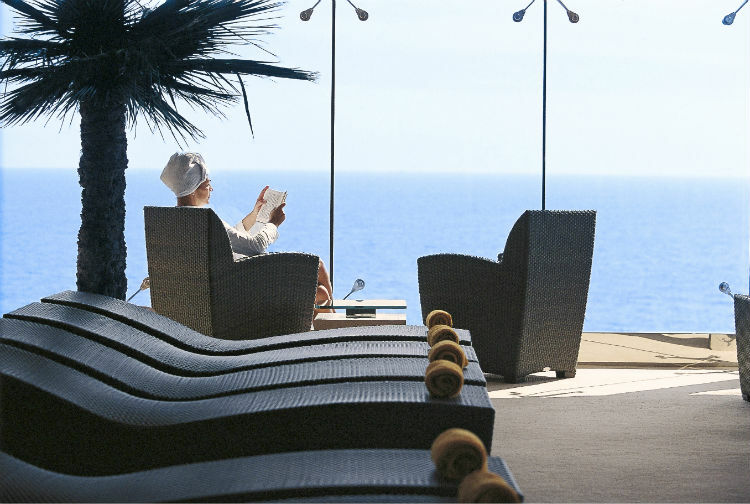 Celebrity Cruises ships have a selection of double sun loungers, and even double hammocks! When you get peckish, you can head to the top deck where you’ll find a lawn with real grass where you enjoy a picnic together before challenging each other to a game of croquet. Splendid. We hope that this article gives you some ideas about how to go about choosing the best cruise for you and your significant other. 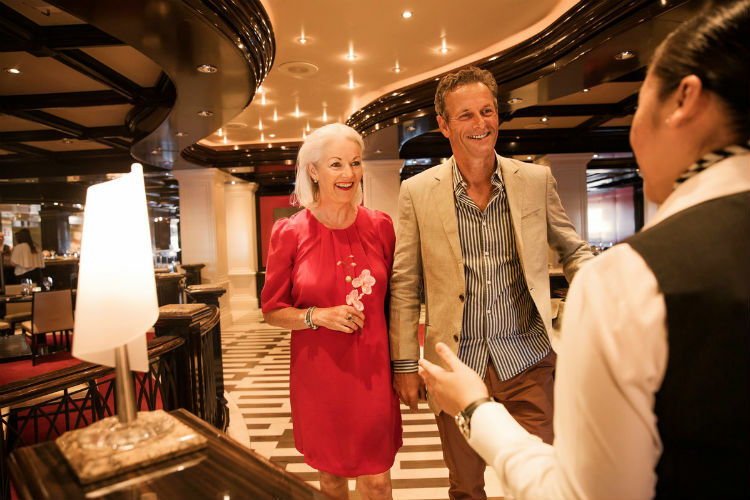 If you’d like to discuss any of these points in more detail, or would like any help in booking your cruise, we have a team of expert Cruise Concierge who would be delighted to help. Just give us a call on 0808 1234 118!